vacoaster09 wrote: Do you think they will go with updated new generation Vekoma trains (with the vest restraints) or with the Kumbak trains (as used on Arkham Asylum in Australia)? I'm almost positive they're using the new restraints. They have said they are doing something to make the ride more comfortable, and they have to order new trains anyway because the old ones left with six flags. Yay! A 130 foot Skyscreamer, and it's not the clunky mondial ones! the ride placement is going to be very interesting. I’m really trying to imagine where the new rides will go. Diamondbacker27 wrote: Yay! A 130 foot Skyscreamer, and it's not the clunky mondial ones! I didn't even read that! These are much better I agree! Some money well spent here. Now KKs flat ride selection is going to be pretty strong. Hopefully that will prompt kings island to up their game in that department. The owner (Ed Hart) has stated that they're not using Vekoma. So I guess it would be Kumbak unless there's another company getting in to the business of replacing Vekoma trains. It's good to see Ed Hart add much needed rides to the dry park and I agree it will be interesting to see where these rides will be put at. It will make the park layout much better and make a lot more sense having the area around T3 open again. There are two awkward dead ends in 2014 that will not be there in 2015. I am excited to see the full announcement. aaron88stang wrote: It will make the park layout much better and make a lot more sense having the area around T3 open again. There are two awkward dead ends in 2014 that will not be there in 2015. I am excited to see the full announcement. Agreed, I hope these are placed around T3. The coaster feels so awkward in the water park. When Kentucky Kingdom kicked off its comeback in May after a five-year hiatus, no one knew if the theme park could recapture its status as a Louisville landmark. But Kentucky Kingdom attracted nearly 600,000 visitors and sold 117,000 season passes in 2014 — strong results that led the theme park's owners to expand the schedule and accelerate investment in new rides for next year. Although the $43 million relaunch included a few stumbles, officials with the Kentucky State Fair Board and city of Louisville are upbeat about the reopening and the park's long-term prospects. "It's really great having Kentucky Kingdom open again," said Clifford "Rip" Rippetoe, president of the Kentucky State Fair Board, the park's landlord at the Kentucky Exposition Center. "It's brought energy to our campus." Kentucky Kingdom's return "has had a significant impact on quality of life and the attraction package we can offer visitors," said Louisville Mayor Greg Fischer. "It also provided a badly needed boost in summer experiences for young people." The theme park will close out its 2014 season this weekend. The owners declined to disclose profits but pointed out that $8 million to $10 million spent on additional rides and improvements for next year is an indicator of results. "We feel good about where we are. We have a very healthy cash flow," said Ed Hart, leader and majority shareholder of an investment group that has a 50-year lease deal with the fair board. The bottom line for parents is that the cost of daily admission, $44.95, as well as season passes, $59.95 for early buyers, will remain the same next year. The season will be lengthened from 94 days this year to 110 days in 2015. 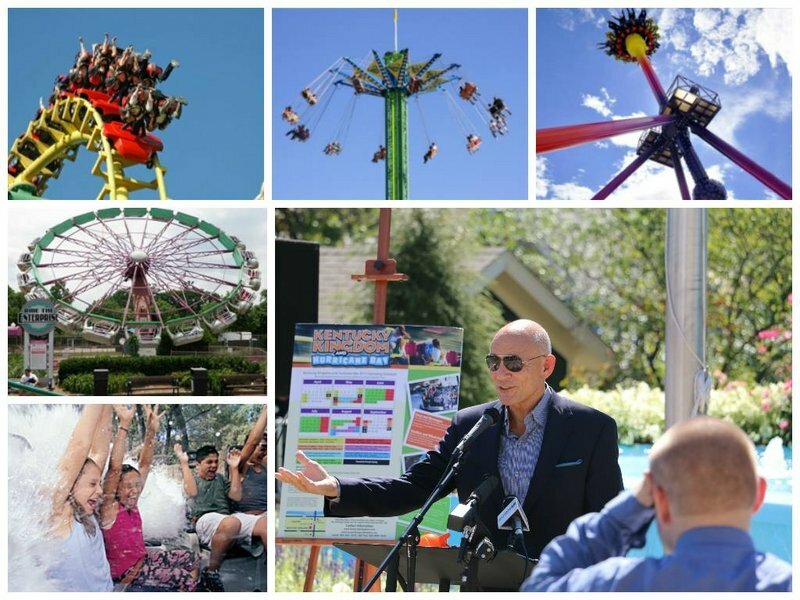 The park will add five attractions next year, including three rides mothballed by prior owners — the T3 roller coaster (a refurbished T2); the Raging River Raft Ride; and the Enterprise, a modernized Ferris wheel-shaped ride that flattens as it spins its passengers in gondolas. A first-person view of the newly-renovated Thunder Run rollercoaster at Kentucky Kingdom. Also debuting next year are two rides — a 130-foot-tall SkyCatcher swing and Cyclos pendulum that rotates 360 degrees — that will cost about $1 million with installation. The focus during 2014 was to create a clean, safe atmosphere where families, particularly mothers, felt comfortable spending a day with their children, Hart said. Feedback from internal surveys and mystery shoppers was positive, he said. The only consistent gripe by patrons centered on the food prices, which Hart said the park addressed by posting the 20 percent discounted rates season pass-holders received for pizza, burgers, chicken nuggets and pulled-pork sandwiches. Many complaints declined after the pass-holder prices went up, he said. Although management focused on training employees to be helpful and courteous, Hart said, it couldn't foresee a controversy that blew up after a teenage employee told a woman who was breast-feeding her infant that she needed to feed her baby in a restroom. Park officials sparked outrage on social media when they explained that policy calls for mothers to be discreet and to use three "health services" stations for feeding. They backtracked within 24 hours, announcing that mothers were welcome to breast-feed anywhere, any time. Hart said they fumbled and learned from their mistakes, including the need to train employees thoroughly on policies. Kentucky Kingdom began in 1987 under a Dallas-based company that went bankrupt after a year. Hart, a New Yorker and one-time retail buyer, stepped in and reopened the park in 1990, expanding it and adding roller coasters and other rides. Attendance grew to 1.3 million by 1998 when Hart sold the park to Premier Parks for $78 million. That company's acquisition of Six Flags theme parks a year later led it to rebrand the property as Six Flags Kentucky Kingdom. Attendance and revenues declined during the next decade, as rides were closed and roller coasters were dismantled and shipped to other Six Flags parks. The largest blow came in June 2007 when 13-year-old Kaitlyn Lasitter, riding the Superman Tower of Power, had her feet severed when a cable broke. Last edited by robbalvey on Thu Sep 25, 2014 2:45 pm.